Boy, do I have a project for you today! Who wants to make a woven, crocheted, gingham baby blanket? I hope you do! 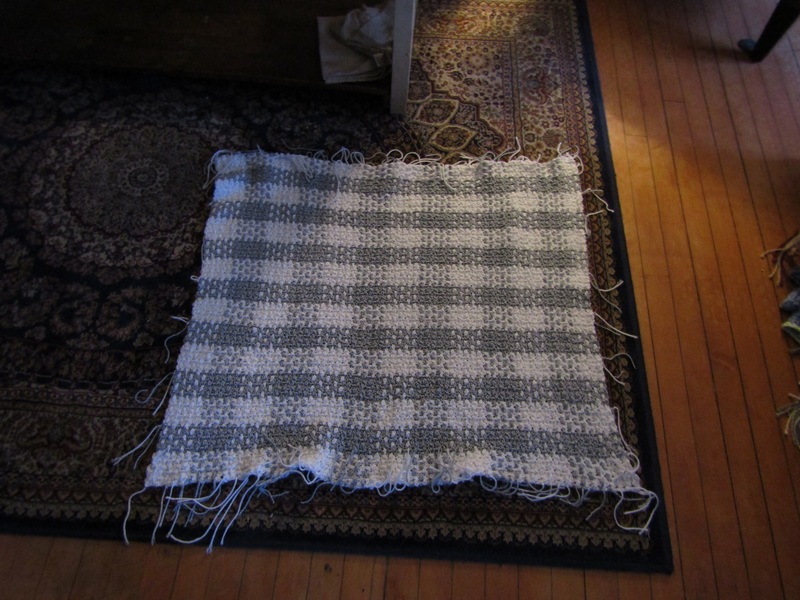 A couple of years ago, I discovered that it was possible to make a plaid, crocheted blanket. I wasn’t able to make one right away but last winter I finished making one for my mom, and I had so much fun doing it! I realized that the concept could work in any pattern, and it made me anxious to try my hand a a gingham blanket. 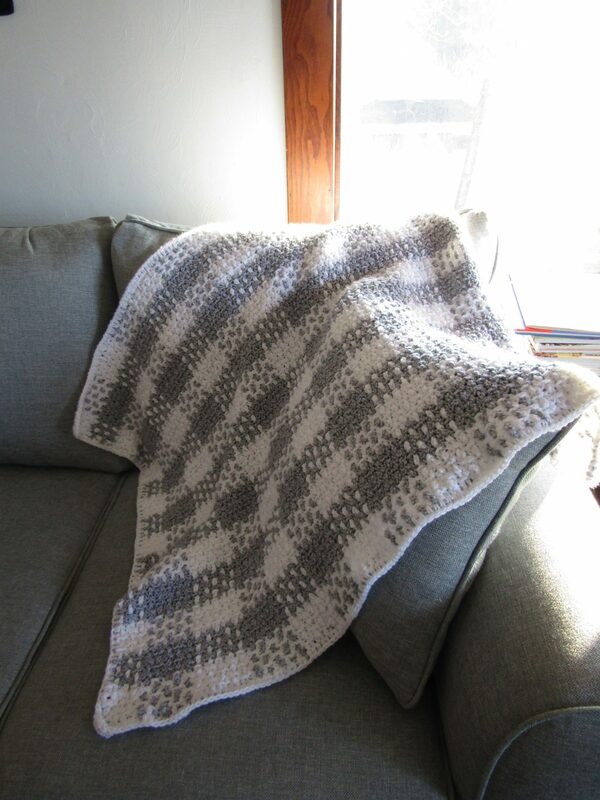 When I found out we were having another baby, I knew I wanted to do a gingham blanket. The only question was what color I’d make it. Well, I got a jump start on the blanket at the beginning of the month so that I could share with you today how to make a woven, crocheted, gingham baby blanket for a homemade holiday! Finished blanket. Now I need to make a few of these in larger sizes as throws for our living room. To get started with this project, you are going to need to make a mesh, crocheted base of equal sized, alternating stripes. Chain 133. Turn and double crochet into the 4th stitch from the hook. Chain one, skip stitch, and 1 double crochet into next stitch. Repeat until you reach the end of the row. 1 dc into 4th chain from hook to begin first row of dc. Chain one, skip a stitch in original chain. 1 dc, ch 1, skip a stitch in the original chain, and 1 dc into next stitch. 1 dc into the original first stitch of the chain, by the tail. Your final stitch for the first row should be a dc. Chain 3, turn, and repeat. Make 5 rows of double crochet of the first color. After you chain 3 at the end of the row, dc into the top of the first dc stitch of the first row, and then chain. Finish your 5th row of dc/ch/dc by chaining one. Switch colors and make 5 more rows in the same manner. Make a total of 15 stripes, each 5 rows thick. (For a longer blanket, continue to add stripes of 5 rows until you reach your desired length. Chain one at the end of the mesh, and tie on your second color. Join the two colors and tie tightly. Chain 3. Begin your next row of stitching using your next color. Your stitches should always land into the top of the previous row’s dc stitches. I actually loved the texture and look of this blanket without the weaving. I could have left it like this 🙂 But I wanted a gingham blanket even more, and I wanted something warmer and a little less holey. When you have finished with the mesh base, you’ll have stripes of white, grey, white, grey… The next step is to weave in chains of yarn through the mesh. To start, I create my chain right onto the end of one mesh row. Chain 127 (or long enough to have your chain reach fully from one end to the other without having to stretch it… this will depend on how tight or loosely you crochet). Tie off. To begin a chain, hook into the first space (or next available space) at one end of the mesh base. Then begin to make your chain. After you have started your chain, check it’s length against the length of your blanket to be sure that it will reach the other end without stretching too much. Weave the chain under, over, under, over, repeating until you reach the other end of the blanket. You will be weaving perpendicular to the stripes of the mesh. Using my crochet hook, I loaded 3 stripes of mesh onto my hook, then pulled the chain through, repeating until I reached the end of the blanket. When I got to the end of the row, I would hook around the end of the row and chain off. Weave your hook through as many rows of color as you feel comfortable with. For me, that was a total of three stripes. A close up of what the weaving looks like. It will be much harder to see as the chain goes through the color that it matches, but as you go through your contrasting color, you’ll be able to see the weaving much better. Hook onto the end of the mesh. Finish hooking onto the end of the mesh row. Trim yarn and pull through. Tie off. The first row is complete! I hook the crochet hook back into the end of the chain after I have tied it off, and then use the back end of the hook to do the weaving. If you start out slow, you can see that the hook should be showing up in the opposite spaces from the first row. Be very careful starting each row of weaving. Make sure you are alternating your starting point for each row of weaving! Weave in 5 rows of one color (in this case, white), and then switch colors. The pattern will really start to show itself after you weave the first two sections of colored stripes in the intersecting direction. Two ends of the blanket will end up having a lot of “fringe” and the other sides will just have a few strands where the colors meet up. Make sure everything is tied of securely so that you do not end up having rows of weaving come undone on you! Since this blanket is for a baby and I didn’t want the fringe to tie around tiny fingers, I decided I needed to find a way to finish of the edges that didn’t involve trying to weave in all of those tails of yarn. To finish the blanket, I ended up doing a double crochet around the spaces between stitches/rows, all of the way around the outside of the blanket, holding the tails of yarn down and crocheting over/around them. I put three stitches of double crochet at each corner of the blanket, and joined my final stitch to the first. Knot, and weave in. Go around the perimeter of the blanket and trim off any loose ends that still are sticking out. 1 dc inot the spaces between stitches. Hold down any tails from the weaving/joining process, and stitch over/around them to secure them in place. 1 dc into the spaces between the rows of stitching and the chains around the perimeter of the blanket. And that’s it! Your blanket is ready to be a gift! Remember that you can always choose different colors for this project. 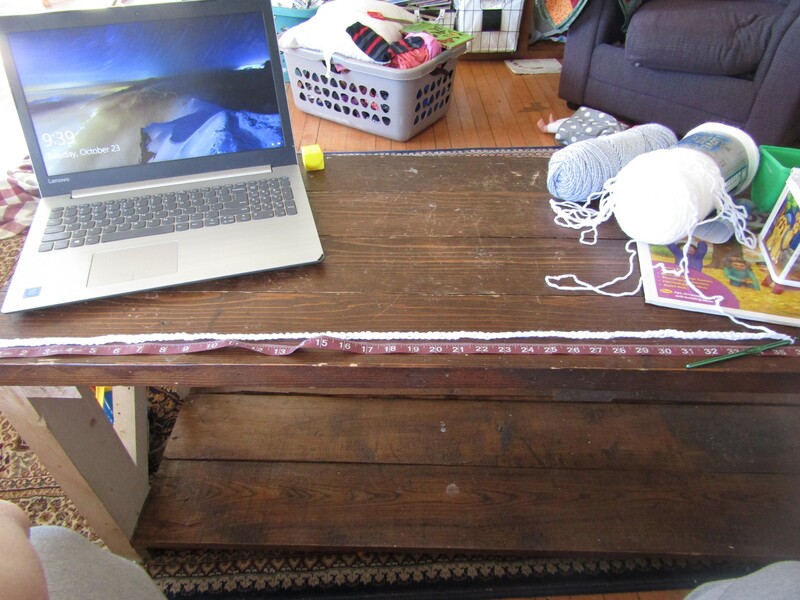 To make the blanket wider, chain an additional 10 stitches for every row of color you want to add to the width. To make the blanket longer, add 5 rows of dc at a time. Feel free to add additional fringe to the blanket like I did on the plaid blanket I made for my mom last winter, to weave in all of the ends, or to find other ways of finishing off the edges of this blanket. The finished blanket is ready for the coming baby! This is the grey yarn label. It was from Hobby Lobby. Grey and white yarn from Hobby Lobby. I chose a two-tone grey, but not exactly a heather. It was two colors of grey, plied together. I found these crocheted, woven blankets to be surprisingly easy to make. Once you get the hang of it, it’s really easy. The mesh goes quickly. The weaving goes pretty quickly. It’s the counting of the chains for weaving that can get to be difficult…remembering how many stitches you’ve chained… When you work on that part, I suggest doing it somewhere private and quiet. I found it was easier to count out loud or under my breath than to do it in my head or when there were distractions around. Will you be tackling this project this holiday season or sometime in the future? Don’t forget to share your pictures with us on our Facebook page! And don’t forget to follow along to see what other projects we’ll be tackling between now and Christmas! There’s an extra post coming on Saturday, and I’m *hoping* to have another one up early next week, if all goes well.